A person interested in a monastic vocation to Newark Abbey contacts the Vocation Director at vocations@sbp.org who will invite him to make several brief visits to the Abbey. Individual cases vary according to circumstances, but the inquirer is encouraged to be in frequent contact, including overnight visits. Eventually he may be invited to come live in the monastery for a week or more. If the candidate wishes to enter the monastery he may apply for admission to postulancy. Under the guidance of the Director of Formation he will live in the novitiate and join the monastic community at prayers, meals and recreation. During this period he will engage in various kinds of work and take certain classes in the monastery as determined on an individual basis. The usual period of postulancy is about six months, although how long it can last depends on the candidate, his relationship/knowledge of the community, and his experience at said community. At the end of the period of postulancy the candidate may be invited to apply for admission to the community as a Novice. If accepted by the community he will spend a period of one year under the Director of Formation (Novice Master) studying the Rule of Benedict, scripture, monastic history, liturgy and other topics. It is during this time that the candidate begins to learn firsthand what it means to be a monk of Newark Abbey by leading a life of prayer, work, and study. Like a Postulant, a Novice is not in vows and is free to leave at any time. If the Novice feels that he is indeed called to be Benedictine of Newark Abbey he applies to be accepted for temporary vows as a member of the community. If accepted by the community, he makes simple vows, which last for a period of three years. During this time he will, depending on the individual monk, work in St. Benedict’s Prep and at other jobs in the monastery, or perhaps engage in formal study. A junior monk who feels that he may be called to the priesthood will need to discern such a vocation with the Abbot and the Director of Formation. 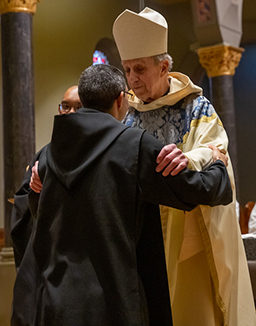 At the end of his three years of temporary vows the junior monk may choose either to apply for solemn vows or extend his temporary vows for up to three more years. Solemn profession of vows is a monk’s definitive commitment to the community monastic life. Can I become a monk if I am a newly baptized Catholic? Yes, however, there is a waiting period required in church law of two (2) years before a neophyte can enter religious life. How long does it take to be come a monk? The formation process takes several years as outlined above. The typical monastic formation period is about 5 years. Am I to old to become a monk? We have an ceiling of 45 for entering formation as a monk, however you should contact the vocation director to discuss options since exceptions can be made depending on circumstances. Can I become a Monk if I am a Roman Catholic Diocesan Priest or a member of another Religious or Secular Institute? Yes, however, you would need permission from your local ordinary (Bishop or major Superior) and would need to follow all the procedures of Canon Law, as well as be accepted by the monastic community. Although the priesthood is a beautiful calling, when a diocesan priest or Religious becomes a monk he must go through the same novitiate as all other monks and he is not granted an easier path, simply because he is a priest. The same is true of those who have formerly been in religious life, or who transfer from another institute. Although we currently have three monks who have been through the transfer process and would attest that the process although challenging is rewarding. Can I become a monk if I am divorced? You can become a monk, only if you have had your previous marriage annulled by the Church and have received a "Declaration of Nullity" also you must have already fulfilled any and all requirements toward children resulting for the previous marriage (i.e. Child support, child has met the age of emancipation, etc.) only at that point would we be able to accept an application from a previously married candidate. Are monks able to stay in touch with family and friends? Yes, monks often see and communicate with their family and friends in their spare time which is not set aside for prayer, lectio, or community obligations. Many monks speak with their families and friend regularly and visit with them particularly during holidays and vacation times. Do monks go on vacation? Yes. Once, professed as a monk, junior monks may take a week of vacation each year and solemnly professed monks may take up to 3 weeks each year.